Epoxyamine Coating Extends Tank Maintenance Intervals: A Sherwin-Williams Protective & Marine Coatings Case Study. A commercial fishing vessel that shows up at a seafood processing facility with its catch housed in rusty fish hold tanks is flirting with potential disaster. The processor may refuse the vessel’s entire haul if it sees rusty water or floating paint chips inside the holds. And when your vessel can hold more than $3 million of value at dock prices, you certainly don’t want to run the risk of corrosion eating away at your profits. 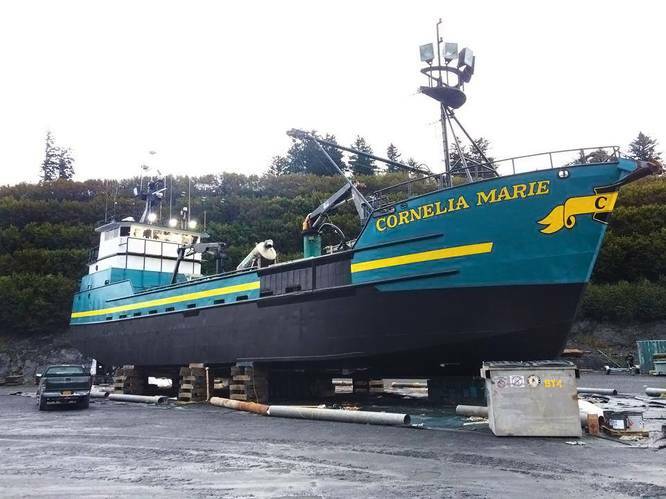 McManus prefers to take his risks crabbing in the unforgiving Bering Sea – not at a seafood processing facility – which is why he recently had the Cornelia Marie’s six fish holds restored. In doing so, he also made a strategic specification change from the thin-film polyamide epoxy coatings he traditionally used to coat the vessel’s fish holds to a more durable ultrahigh-solids epoxyamine coating that could deliver a longer service life. Whereas the traditional polyamide epoxy coating would typically last only about five years, the epoxyamine coating is expected to triple the fish hold maintenance interval to about 15 years. In addition, the epoxyamine coating can be returned to service within a day of application, which is significantly faster than the nearly weeklong wait required with polyamide epoxy coatings. Postponing fish hold maintenance can be a potentially costly risk for vessel owners. Yet, proactively addressing fish holds can be difficult, as the downtime required to maintain the tanks typically spans at least a week due to the long return-to-service times of traditional thin-film polyamide epoxy coatings. That’s a lot of downtime to plan for in dry dock when other areas of the vessel are likely prioritized for coatings maintenance. The shorter, 24-hour return-to-service time of the selected epoxyamine coating – the 100% solids, plural-component SherPlate PW Epoxy coating – was a draw for McManus when considering restorations for the Cornelia Marie. The Cornelia Marie’s fish holds were showing visible signs of corrosion and flaking paint – the very issues that could spell disaster for a day’s catch – following about 10 years of service with no overhaul and minimal coating touchups. To restore the vessel’s six holds, which have a total volume of over 15,000 ft3, McManus’ crew dry docked the vessel at Seattle’s Northlake Shipyard in April 2017. At the shipyard, a crew from marine surface preparation and painting contractor International Marine and Industrial Applicators LLC set up containment systems, removed salt contamination, and abrasive-blasted the fish holds to prepare the steel substrate for coating. The crew removed all rust, debris, and mill scale and left a 3- to 4-mil profile to enhance coating adhesion. Next, the crew sprayed the edge-retentive SherPlate PW Epoxy coating directly to the metal substrate at 20-30 mils dry film thickness (DFT) in a single application. The application provided a high build on the numerous sharp edges and corners in the fish holds to enable a longer service life. In addition, the application will accommodate temperature swings inside the fish holds, which range from about 27°F to 68°F, due to the coating’s excellent flexibility. While the restoration project took about two weeks, the majority of time was spent on equipment staging and surface preparation. The crew completed the coating applications over two days for all six fish holds, and McManus was able to return the tanks to service one day after the epoxy applications were complete. The SherPlate PW Epoxy coating application has held up very well after over a year and a half of rigorous service. The durable cured epoxyamine coating has withstood scrapes from sharp crab shells, hard impacts from brailers used to offload crabs, and violent knocks from nozzles and hoses used to offload salmon. McManus expects to realize about 15 years from the application before requiring significant maintenance. Should impact damage occur in the meantime, the vessel’s crew can touch up those areas using cartridge tubes, helping the Cornelia Marie stay in service longer with fewer delays for coatings maintenance. 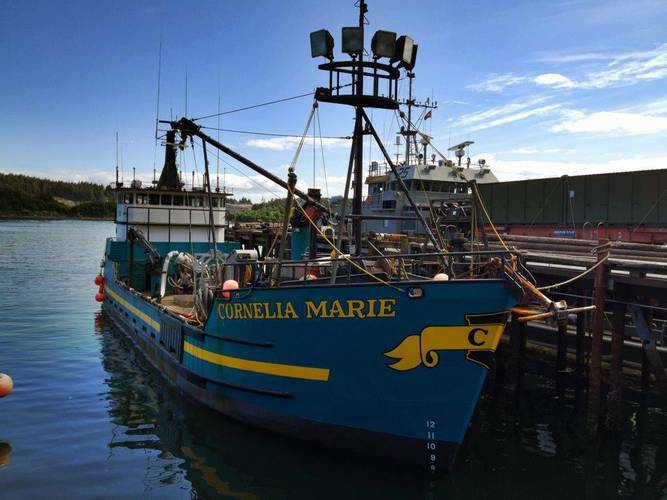 About two years prior to restoring the vessel’s fish holds, the Cornelia Marie’s owners restored the underwater hull, freeboard, and areas of the superstructure. They dry docked the vessel at a shipyard in Kodiak, Alaska for the hull restoration. Monitored by Sam Schuetz, a Marine Technical Specialist for Sherwin-Williams Protective & Marine Coatings, Cornelia Marie crewmembers washed the underwater hull using equipment from Paradigm Marine. They removed algae growth and slime using a light pressure wash and then finished with an ultrahigh pressure wash at 38,000 psi to take the hull down to the existing tight anti-fouling coat. Next, the Cornelia Marie crew removed loose debris with hand and power tools before securing approval from Schuetz to prepare the vessel for spray-applying an anti-fouling coating. The preparations included setting up a containment system and masking freeboard areas to protect lettering and other design elements. Finally, applicators from C&M Enterprises performed the coating applications. They first primed any bare steel using Corothane I MiO-Aluminum and then spray-applied a tie coat of Sherwin-Williams SeaGuard 6000 primer to the hull. Next, they applied a single 10- to 12-mil wet film thickness (WFT) coat of SeaGuard Ablative Anti-Fouling epoxy within hours of priming to avoid delamination. For the topcoat, applicators applied Hi-Solids Polyurethane Gloss at 3-5 mils WFT in the distinctive Cornelia Marie teal color. When the Cornelia Marie docked in Seattle a few months later to receive new engines and updates to its living areas, the vessel’s crew recoated the main deck and lower house. They applied three coats of SeaGuard 6000 epoxy by brush and roller at 5-7 mils DFT per coat on the main deck. In addition, a crew from Northlake Shipyard spray-applied a coat of SeaGuard 6000 at 5-7 mils DFT in the engine room followed by a topcoat of Hi-Solids Polyurethane at 3-5 mils DFT. Following the maintenance and restoration work performed on the Cornelia Marie, Sherwin-Williams coatings are now protecting the vessel from its haul to its hull. The protective coatings applications will help keep corrosion at bay and extend maintenance intervals, so the fishing vessel can maximize its earning potential by staying in the water as long as possible between dry docks. Ray Meador is a Marine Coatings Representative for Sherwin-Williams Protective & Marine Coatings. His coatings career spans over 40 years, including more than 30 years with Sherwin-Williams, serving in such roles as corrosion specialist and sales representative. He is a NACE Certified Coating Inspector – Level 3. He can be reached at ray.g.meador@sherwin.com. This article first appeared in the November 2018 print edition of MarineNews magazine.